Ecclesiastical modes, also named "Greek modes"or "church modes" or "Gregorian modes" formed in the Middle Ages a set of scales whose use has weakened because of the appearance of the major / minor tonal system. Several centuries later these modes have reappeared. They are very used in jazz improvisation as scale of chords and modal playing. 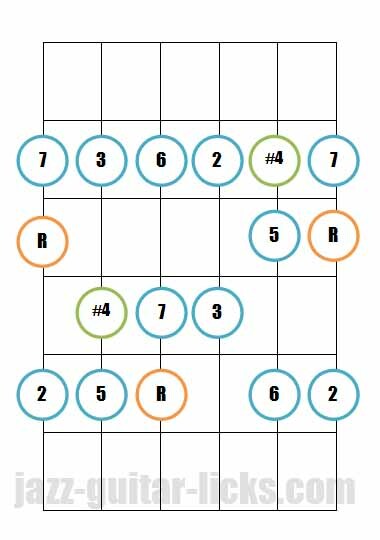 This lesson explains how are built modes and how to play them on guitar. 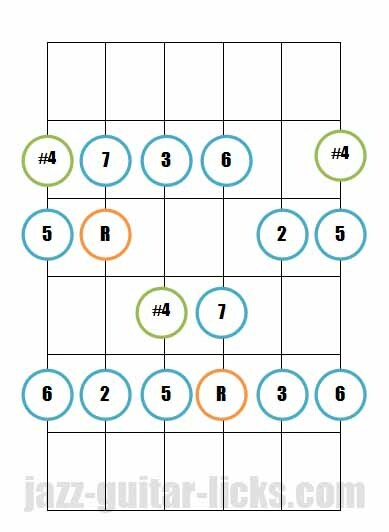 What Are The Seven Modes Of The Major Scale? Modes are built by moving the root on each degree of a scale. Each mode as a specific succession of tones and half-tones corresponding to a chord. Major, major seventh (M7) , major sixth (M6 or 6) , major ninth (M9), major six/nine (M6/9), sus 2, sus 4. The Dorian mode is the second of the seven musical modes. It is a minor type scale because of its minor third (b3). 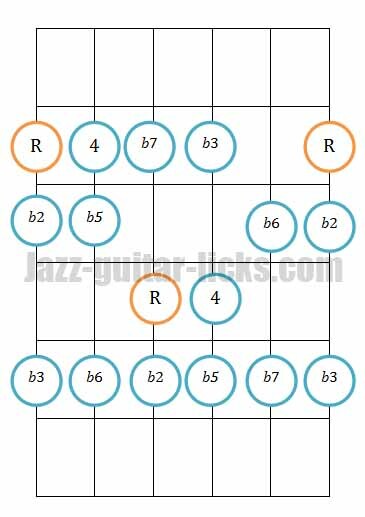 It is often the first choice to play over minor chords and one of the most important scale to know for a jazz guitar improviser. It is made up of seven notes including a minor third (b3) and minor seventh (b7). It has the same notes as the Ionian mode starting on the second degree. The Phrygian mode is the third mode of the major scale. It is one of the three minor modes of the major scale. These modes are Dorian, Phrygian and Aeolian (natural minor scale). The Phrygian mode is a minor type scale because of its b3. 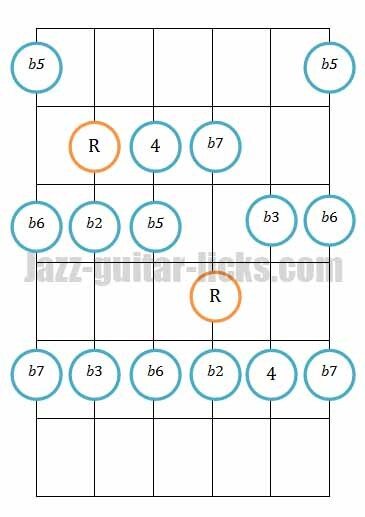 It can be played over minor chords, but it is rarely used because of its b2 scale tone. This mode has the same notes as the Ionian mode, it is the third mode of the major scale. You just have to start on the third of the Ionian mode to get the Phrygian mode. The Lydian mode is the fourth mode of the major scale. It is very used to play over major chords, it is a major type scale (because of its major third). The Lydian mode has a very interesting sound because of its #4 (or #11), it is similar to the Ionian mode but has a raised fourth (#4) instead of a perfect fourth. Playing the F Lydian mode over a C major chord is the same as playing the C Ionian mode starting by the fourth (F). 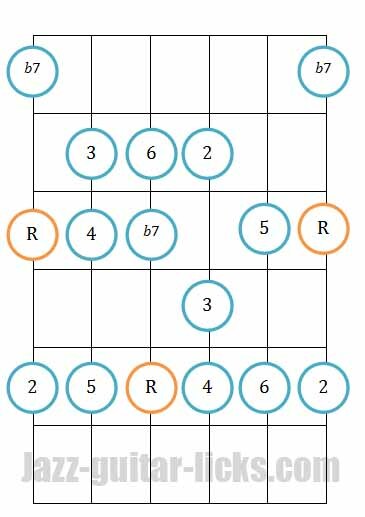 Lydian mode gets interesting when it is played over a major chord, for example playing a F Lydian scale over a CM7 brings tension because of the raised fourth / Raised eleventh (#4). The Mixolydian mode is the fifth mode of the major scale. 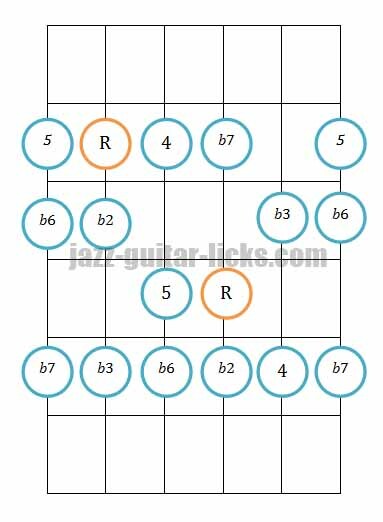 This is a major type scale (also called dominant scale) because of its major third (3) and its minor seventh (b3). It has the same notes as the Ionian mode except the minor seventh (b7). 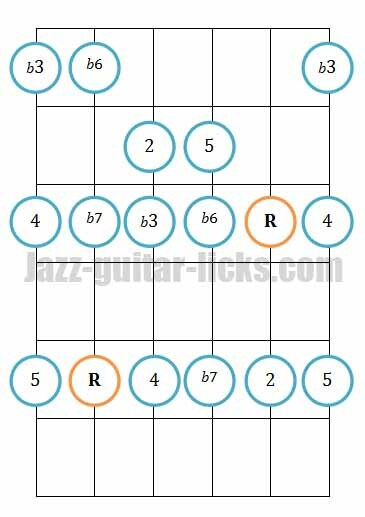 This is the mode to know when you want to play over dominant chords (not altered). 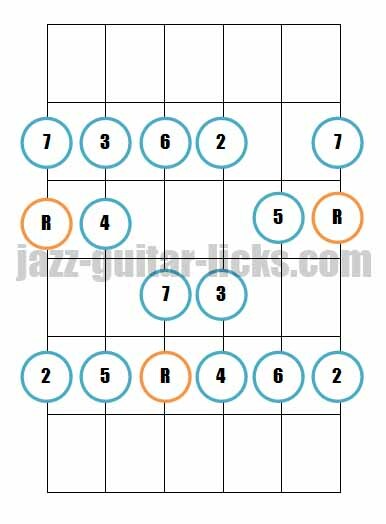 This mode is widely used in jazz and blues music it's one of the most important mode to master. 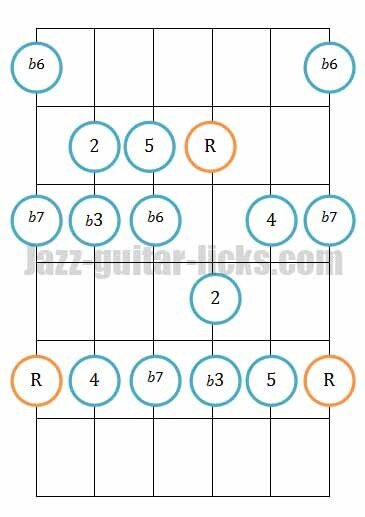 The Aeolian mode (also called "natural minor scale" or "relative minor scale) is the sixth mode of the major scale, it is known as a relative minor to the major scale (ionian mode). 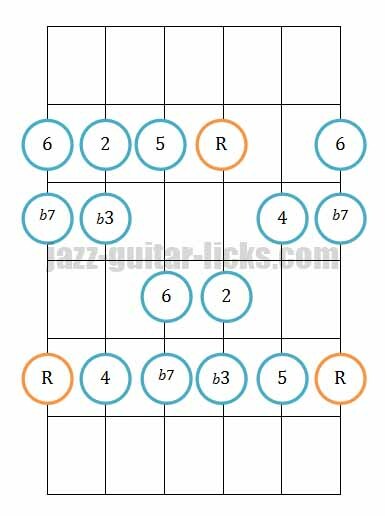 This mode can be formed by using the same notes as the major scale, but starting and ending on the 6th degree of the major scale. You can consider this 6th degree as the root. 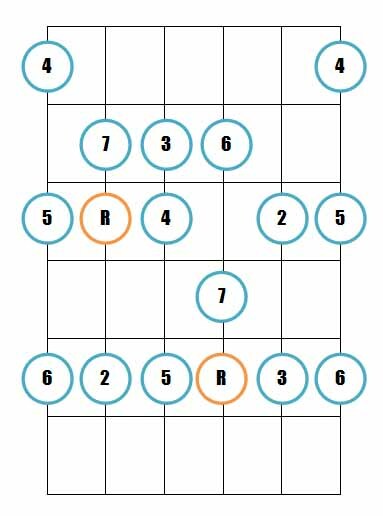 This is the third of the three minor modes (Aeolian, Dorian and Phrygian) of the major scale and a very important minor mode to master. It has a minor third (b3), a minor seventh (b7) and a minor sixth (b6). 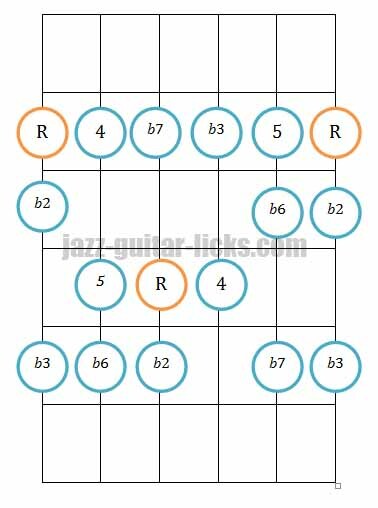 The Locrian mode is the seventh mode of the major scale. It has a particular sound because of its b2, its b3, b5, b6 and b7. It is the least used, and probably the most misunderstood out of all of the modes of the major scale. It is usually played over minor seventh flat ninth chords (m7b5), in a minor II-V-I sequence for example. 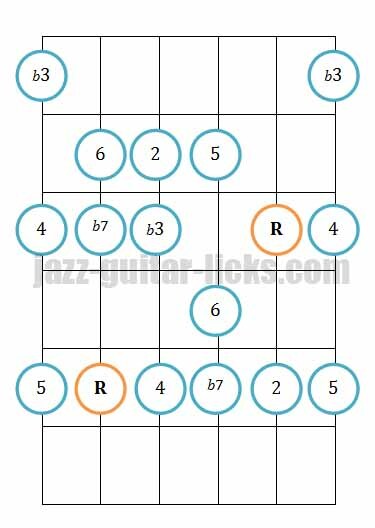 This music infographic in a retro style is an efficient and fun reminder for any guitarist or composer who want to learn how to harmonize the major scale with drop 2 seventh chords. 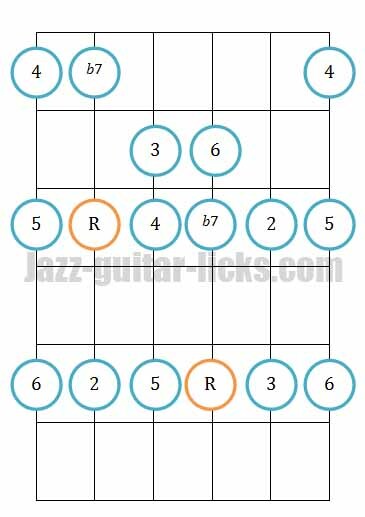 This guitar lesson explains how to mix minor and major triads in order to play blues arpeggios on jazz blues tunes. This youtube video contain a guitar transcription with tab and standard notation of "In a mellow tone" (theme) by Kenny Burrell. This jazz lesson explains what is the tritone substitution and how to use it over the main chord progressions with a few examples.